A sinkhole swarm is happening right now in China. China’s northeastern city of Harbin has suffered a sudden appearance of sinkholes this month, triggering a feverish discussion on Chinese social media sites about their cause and what they mean. Around seven sinkholes appeared in the city between Aug. 8 and 17, killing two and injuring two more, Chinese Internet news portal Sina reported. Two cars also fell into sinkholes that opened up in the middle of two roads. Mr. Tang, a computer technician at an electronics store in Harbin’s Nangang District, told The Epoch Times that he witnessed a sinkhole appear near Jiahua Road several days ago. “A man who was walking on the street fell and suddenly disappeared,” he recalled. Harbin local Mr. Chiang, who also lives in Nangang District, told The Epoch Times that sinkholes are now a relatively common phenomenon in the city, adding that residents say they formed due to the construction of an underground railroad system. Sinkholes in urban areas can be caused by rainwater seeping through the pavement, but Chiang said in Harbin, they also occur in dry weather. 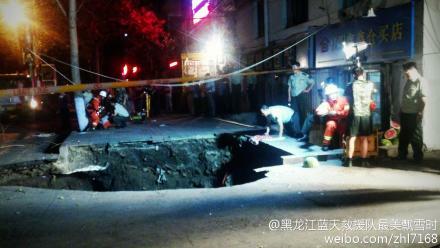 In recent years, sinkholes have appeared in major cities like Beijing and Shanghai. More than 50 cities across China have experienced sinkholes, according to a report by the State Council released February. According to the Party mouthpiece People’s Daily, the widespread construction of skyscrapers and poor development of underground water drainage systems is to blame. Sinkholes have attracted a great deal of attention on China’s social media sites, including the popular Sina Weibo microblogging service. Others pointed out that bad infrastructure caused by local government corruption is the real cause. This entry was posted in Pictures and tagged China, China sinkhole, Harbin, sinkhole. Bookmark the permalink.